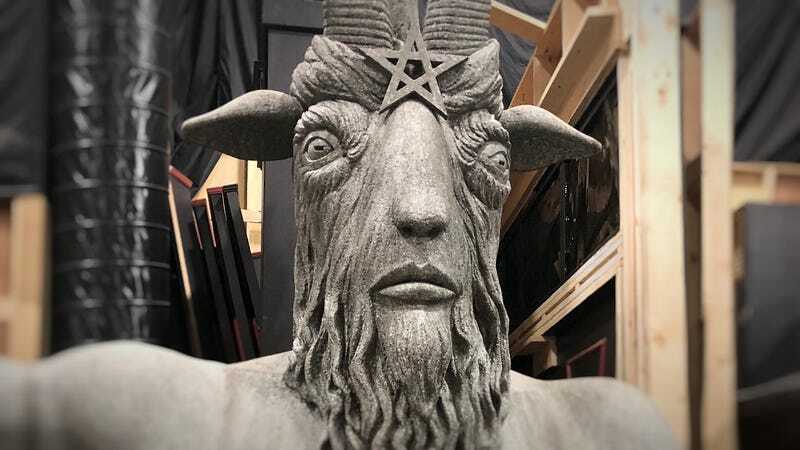 The (foam) statue of Lord Satan that graces the Academy of Unseen Arts. Hail Satan. Stepping onto the set of Netflix’s The Chilling Adventures of Sabrina is like accepting an apple from a serpent. Dark forces offer truth, hint at stories and Easter eggs beneath the red, ripened flesh. Secrets of the show’s characters and mythos are built into every room, from the walls created with Sacred Geometry to a hall of hexed shoes. A world of knowledge beckons, and we’re going to take a big, luscious bite. I recently had a chance to visit the Vancouver set of The Chilling Adventures of Sabrina, which debuts on Netflix October 26. It was a comfortable but chaotic time for the series. They’re currently filming season two—meaning the actors have found an ease with their roles and with each other, but the twists and turns their characters are undertaking have only just begun (sadly I can’t get into them, as I’ve been sworn to secrecy). Through the chaos and uncertainty, the real glue that holds them together from scene to scene—and season to season—is the sets. A comic book club sign-up sheet spotted in the halls of Baxter High. Note the “J+B” heart in the corner. Production designer Lisa Soper has created a world that tells the story of Sabrina as well as the pages of each episode’s script. It’s not enough just to have fun nods to classic horror works, like Suspiria and Hellraiser’s Clive Barker, or Riverdale Easter eggs, although Sabrina has all of that—for example, Soper pointed out a school library bookshelf that features a carving of a Jughead crown with the words “was here.” For Sabrina, every room and location is instrumental in conveying the themes of the show, as well as the inner psyche of the characters. And Soper did her homework. Soper, a practicing pagan, started by doing tarot card readings for each of the Sabrina characters to determine their mood, color, and personality. She said she’s done this for most of her previous shows and films, including House At The End Of The Street, starring Jennifer Lawrence, and The Blackcoat’s Daughter, which featured Sabrina star Kiernan Shipka. Sabrina herself was “The Magician,” whose card features a big red cloak—hence one of the reasons why Sabrina’s main color is red, and you can spot red objects in many of the scenes she’s in. Kind of like a “follow the white rabbit” thing. Those tarot readings, along with other information about the characters and their journeys, were used to help create their bedrooms, each of which tell a hell of a lot about them and where they’re headed. For instance, there’s Susie Putnam (Lachlan Watson), one of Sabrina’s friends who’s being bullied at school for not conforming to gender norms. Susie’s room is full of bugs, butterflies, and other creatures that undergo metamorphosis, as that’s something the character is going through as well. A peek inside Sabrina’s bedroom, which Lisa Soper said was designed to reflect duality and conflict. There’s also a Friday the 13th-esque poster, which Soper said is Sabrina’s original work. You’ve also got Sabrina’s cousin, Ambrose Spellman, a warlock who’s under a centuries-long house arrest. Soper made his attic incredibly chaotic. It’s messy and disgusting—papers strewn about, old beer bottles on the floor, chairs and baby cribs tied to the ceiling—but it’s also a heartbreaking reminder of his loneliness. Soper placed a collage of photos from her world travels over Ambrose’s bed to remind him of all the places he wants to escape to, but can’t. He’s trapped, and the place that should be his refuge reflects that. His room very much represents his mind. It’s oddly, and kind of uncannily creepily, inviting and cozy and warm. But by the time you go there, you feel that it’s tortured...I try to, in scenes, interact with his room and move about it, because it’s like it’s his mind. Whenever he’s in his room, all the scenes he’s in, he’s speaking to Sabrina and it’s problem solving. Like you go into different parts of your mind to problem solve, he’ll walk to different parts of his room. Then there’s the Spellman House set as a whole. It’s designed as a spiral, not only so characters can move freely between rooms, but also because that’s a sacred pagan symbol for life, death, and rebirth. In addition to the layout, there’s something else unsettling about the house—and I’m not just talking about the dead lizard skins on the end tables or rusty chains on the morgue fridges (which Soper said may come into play in an episode). You might not actively notice it, but subconsciously it’s there. Everything is crooked. According to Soper, the walls, staircase, and floors might look symmetrical, but they’re not. She said it was a pain to construct, but it makes it so the camera can never get a perfect shot. It leaves the whole house looking slightly off-kilter. However, there’s one thing that doesn’t look off: The wallpaper. You might be curious why I’m pointing out something as innocuous as wall dressings, but they actually point to one of the most important conflicts on the show. As you can see in the photo above, nature is present on many of the walls in the Spellman House. Trees, flowers, vines. This is because co-existence with nature is at the heart of pagan belief. By putting it in the wallpaper, and having a lavish greenhouse and other plant life in their home, this indicates that the Spellmans are at one with nature. They literally co-exist with it. Compare this to the Church of Night’s church, where devotees of Satan gather to hear Father Blackwood’s (Richard Coyle) unholy gospel. Like many organized religions, such as Catholicism, the Church of Night has a patriarchal structure. Men are the leaders and women do not hold positions of power. They’re forced to sign over their very souls to a male figure. This is a key conflict in Sabrina, as its lead and other women on the show question why they have to defer to men—especially when you can argue they’re the more powerful ones. A statue of the Virgin Mary inside the Church of Night. This is one of the only church statues with its head still attached. This isn’t a commentary on feminine power, they simply forgot to remove it. The church, which is in the middle of the forest, isn’t co-existing with nature so much as being surrounded by it. Decaying brambles and branches creep through the windows, snake the walls, entwine around headless statues. They’re a reminder that the Church of Night is fighting against nature by keeping itself as a patriarchy and oppressing women. And nature is fighting back. The story of Sabrina might get its words from the comics and scripts, but its voice is found in the world that’s been created around it. The sets are dripping with juicy details, telling a story about a group of people who are trying to figure out who they are as they face insurmountable odds. Much of it might be lost to the background, as of course we tend to focus on the people rather than the props, but it’s wonderful to see a series that cares this much about filling the frame with purpose and intent. Having seen it for myself, I feel like I’ve taken a bite of that apple, and my head and heart are filled with forbidden knowledge. Truths about a ripe and rich world I won’t soon forget.